Blue Cheese may be the tastiest salad dressing around. It has a tangy, robust flavor that makes you want to eat it by the spoonful. And it’s versatile! You can use it on salad, of course, but also as a dip (think Buffalo Chicken Wings) or even as a sauce. And it’s de rigueur on Wedge Salad. That big ole hunk of iceberg lettuce crowned with creamy dressing was a standby of the “fine dining” scene in the 1950s and 60s. It declined in popularity for a while, as Americans discovered that lettuce didn’t have to be iceberg. But lately Wedge Salad has been making a comeback. I’m seeing it on restaurant menus more often, particularly at steak houses (where it might never have left). Example? Take a look at the dinner menu for Morton’s Steakhouse, where it appears as “Center Cut Iceberg” salad. Many people continue to view iceberg lettuce as the ultimate in untrendy. But almost everyone agrees that Blue Cheese Dressing is terrific, no matter what you put it on. The most important element in Blue Cheese Dressing is, as you might imagine, the blue cheese. I think it tastes best with Italian Gorgonzola or French Roquefort. But British Stilton is also good. Even domestic generic “blue cheese” is pretty tasty. I’m partial to the soft creaminess of Gorgonzola, so that’s what I generally use. The dressing is usually made with a base of mayonnaise, sour cream, and/or yogurt. You can play with the quantities and proportions of these ingredients to come up with a flavor that pleases you. I prefer about 2 parts mayo to 1 part sour cream, so that’s what we’re using in today’s recipe. This recipe makes about 2½ cups, and preparation time is 5 to 10 minutes. It keeps well covered in the refrigerator for about a week. But you’ll have consumed it long before then. Combine mayonnaise, sour cream, and crumbled blue cheese in a mixing bowl. Beat ingredients together with a wooden spoon until the mixture achieves a smooth-ish consistency, but with some lumps of blue cheese (a wire whisk doesn’t work well for this — the mix tends to lump up in the whisk). Beat in wine vinegar, salt, and black pepper to taste. Thin to desired consistency with milk, and beat in minced parsley. Chill in a covered container for at least an hour before using. 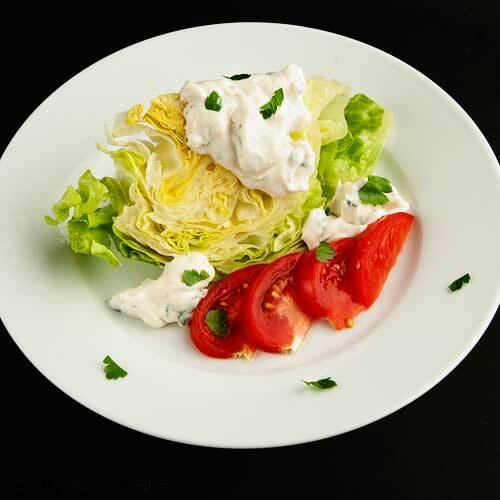 At its most basic, Wedge Salad is nothing more than iceberg lettuce washed, cut into wedges (4 - 8 per head of lettuce is a good number), and served with a good-sized dollop of salad dressing on top (Blue Cheese Dressing is traditional, although some are partial to Thousand Island Dressing). Wedge Salad often is garnished with tomatoes and/or bacon. A garnish of fresh herbs — I like parsley and/or chives — is also common. Some people turn up their noses at iceberg because it isn’t as flavorful as other lettuce varieties, nor is it quite as nutritious. In fact, I’m one of those people. I hadn’t bought it in years until I decided to make this recipe. But it has a crisp, crunchy texture that is fun to munch (and great in tacos). And it’s still the most popular lettuce sold in the US, so someone must be buying it and enjoying it. One head of lettuce serves 4 - 10 (depending on how big you cut the wedges). Preparation time is 5 minutes (add another 10 to prep garnishes), although after the lettuce is washed you should allow it to crisp in the refrigerator or at least an hour. 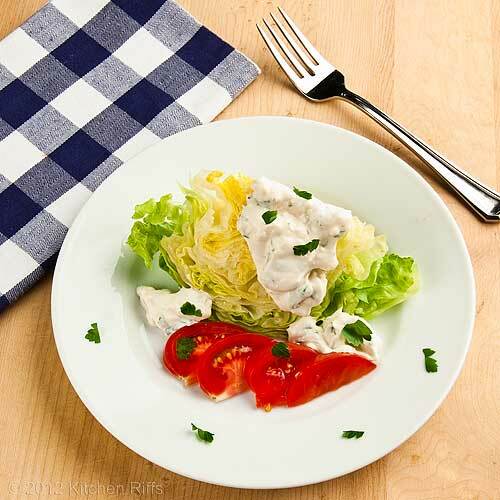 You need about half a recipe of Blue Cheese Dressing for a head of iceberg (although if your arteries can take it, using the entire recipe is great on this salad). Wash lettuce, cut off root end, remove any bruises or discolored outer leaves, and cut head into as many wedges as you wish. Wrap in a towel and chill in the refrigerator for at least an hour. If using tomatoes as garnish (I highly recommend this), wash and cut into wedges or slices. If using bacon as a garnish (both good and traditional, but IMO a bit over the top given the richness of the dressing), put 1 or 2 pieces of bacon per person on a paper towel-covered microwave-safe plate, cover the bacon with a paper towel, and microwave until done (anywhere from 1 - 5 minutes depending on your microwave and how many pieces you’re cooking). When crisp and done, cut into bits. Alternate method for bacon prep using stovetop: Cut bacon into pieces of about 1 inch, put in cold frying pan, and put on stovetop on medium heat. Cook until bacon is crisp, about 10 minutes. Drain on a paper towel. Place each wedge of lettuce on a serving plate. Add a big dollop of dressing (at least 2 tablespoons). Garnish with optional tomatoes, bacon bits, and parsley or chives. Serve and enjoy. Buttermilk is an excellent substitute for regular milk when making the dressing. Its tangy flavor combines well with blue cheese. Gorgonzola and Roquefort are expensive. A less expensive blue cheese won’t deliver quite the same snap, but it will still provide tons of flavor. If you are using the dressing as a dip, you may want to omit the milk, since you might prefer a thicker consistency. Some people would also omit the wine vinegar or lemon juice, but I like the ping it gives. Many recipes for Blue Cheese Dressing add chopped onions, scallions, or onion powder. A couple of tablespoons of onions or scallions is an excellent addition. I haven’t used onion powder in this, but I would think perhaps a teaspoon or so would be tasty. 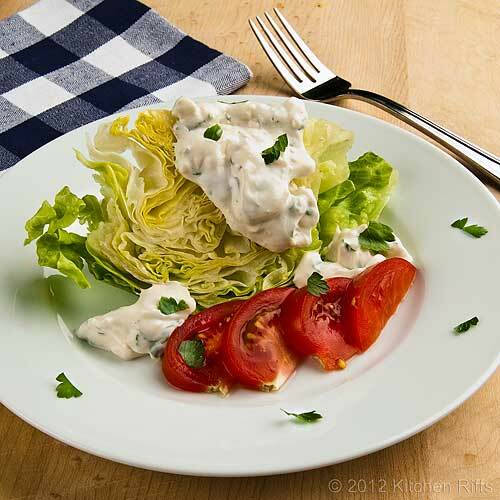 While homemade Blue Cheese Dressing is wonderful, most commercial versions are not. In fact, they’re often way too sweet, and practically inedible. However, some of the dressings sold cold in the produce departments of supermarkets are actually tasty. I’ve used and enjoyed the Marie’s and Marzetti brands. But I much prefer my own. Iceberg lettuce seems to last forever in the refrigerator. Well, not forever, but it will still be good after a week or two — by which time leaf lettuce or even romaine will be well on its way to becoming compost. So if you’re cooking for only 1 or 2, you can serve up Wedge Salad several times over a 2 week period. A head of iceberg also makes a good bowling ball if you’re looking for some spur-of-the-moment sporting activity around the house (just saying). 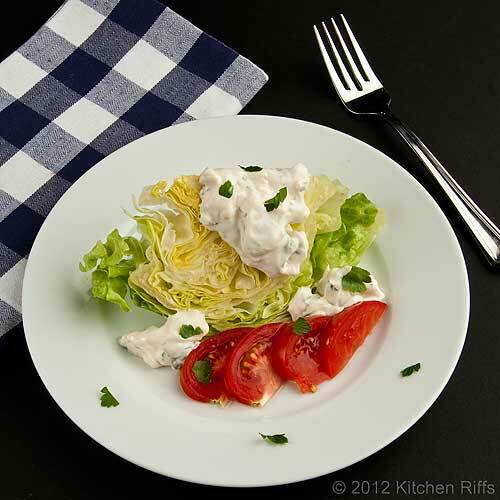 Wedge Salad is often served with crumbles of blue cheese as a garnish. That’s gilding the lily, in my opinion — the dressing itself delivers plenty of blue cheese flavor. But if you like it, go for it. Thinly sliced red onion makes another nice garnish for your Wedge Salad. And that ultimately is the problem with iceberg. It does have flavor — just not very much. But I can see how its crispy crunch appeals to many people. And it looks rather interesting. Pair it with bolder flavors — like Blue Cheese Dressing — and it’s a pleasant enough eating experience. Wedge Salad works, I must admit. Still, it’s not a dish I’ll serve very often. I have better uses for Blue Cheese Dressing. Like another classic recipe that I’ll be doing sometime next week: Chef’s Salad. I haven't had Blue Cheese dressing in so many years. Not because I don't love it but because it doesn't love my waistline and I can't seem to get enough of it once I start eating it. Yours looks wonderful and I will say restaurants serve it on a nice crisp wedge of iceberg all the time. The only time you'll find me eating iceberg lettuce is in a wedge salad loaded with blue cheese dressing and crisp bacon ... in this instance, iceberg is the perfect vehicle to deliver those amazing toppings into my mouth! Love your dressing recipe ... putting this on my "to make" list soon! Personally, I never liked blue cheese but over the last few years I have really come to enjoy it. I really like it as you show it-on a wedge. And I love keeping head lettuce in the fridge. For one-it keeps awhile and two- I love the crunch on a sandwich. I will try this. Looks great. Thanks! Hi Vicki, it's an occasional thing for us, too. But one of those occasions I always look forward to! Thanks for commenting. Hi Kimberly, it really is a great vehicle for those terrific flavors! Although the more I think about it, one of the virtues of iceberg is it adapts to well to other flavors (a little like tofu). That's why it works so well in a taco - there's already loads of other flavor there, but the crunch dimension is kinda nice. Anyway, thanks for your comment. Hi This is How I Cook, that Wedge Salad recipe really does work - mainly because of the blue cheese. And I agree, that crispy crunch is really fun. Thanks for stopping by. I used to work at a restaurant that had a wedge salad (it was called the "Bistecca" salad due to the steak knife that it came with the chop it up). It had diced tomatoes, bacon, blue cheese dressing and crumbled gorgonzola. Not bad for a non-entree salad! Not surprising, it was also a big hit with the older crowd during lunch hours. I'm not sure I've ever seen it with just sliced tomatoes though, might have to try that out. Hi Normal Food, bacon and the blue cheese crumbles are, I believe, pretty typical garnishes. And who can resist bacon? I actually do have pictures of this dish with a bacon garnish, but ended up liking the ones without better, so that's what I went with. Thanks for taking time to comment. 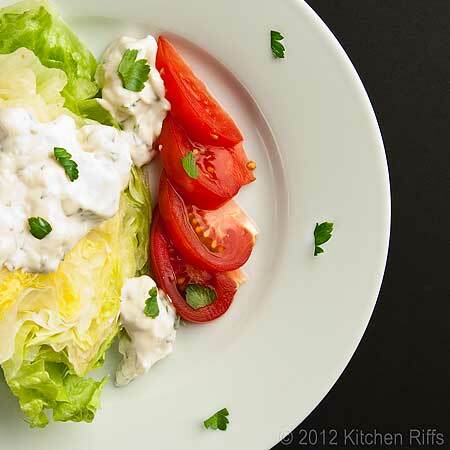 Hi Maureen, you know, the last time I had wedge salad — before I wrote this post, of course — was also the 70's! In fact I had totally forgotten about it until I read about it on a blog (I think David Lebovitz but I won't swear to that) maybe a year ago. It was after that that I started noticing it had been there all along - it's on a surprisingly large number of restaurant menus, but I had simply managed to ignore it. Anyway, it's probably time for you to have one again - if for no other reason to savor the blue cheese dressing without being distracted by the flavor of the salad itself! Thanks for commenting. Hi Biren, it's wonderful, isn't it? And the wedge is a classic - although sometimes I wonder why! Anyway, it's a fun salad. Thanks for stopping by. My husband loves blue cheese dressing, and I'll have to try this homemade version. I'm with you on iceberg lettuce. Not a lot of flavor, but I do enjoy the crunch in a sandwich. I like blue cheese dressing, but don't make it often because of the calories. I agree that iceberg lettuce is a good vehicle for it - the fact that it doesn't have too much flavor on its own makes the blue cheese salad dressing really shine. Hi Beth, homemade is so good! The refrigerated ones aren't bad, but they pale in comparison. The whole texture thing of iceberg is kind of interesting. I'm wondering if there's something creative one could do with it (and make a virtue of its lack of flavor). Not something I'm going to do right away, but I'm going to be thinking about it. Thanks for commenting. Hi Guru Uru, the tang is excellent. And it's pretty - I love the texture of the cut face of the wedge - so craggy! Thanks for stopping by. Hi Biana, the calories are indeed a concern. And you're right about the uncanny of the iceberg to make the dressing's flavor dominate! I had a lot of fun making the salad and writing the post. But enough fun to last me for awhile regarding iceberg! Thanks for commenting. This looks so inviting! The dressing looks so creamy and delicious. I found the juiciest cherry tomatoes and the crunchiest lettuce...This is just perfect! Haha - that someone could be me! :-) I actually like crisp iceburg because it goes well with Asian (soy sauce based) dressing. I'm not a big fan of blue cheese itself, but I do like the dressing. Never made homemade though. I should give this a try at home! Hi Bam, yeah, I must admit I've never actually used the iceberg as a bowling ball, but it sure seems to have the heft of one. And the Blogger software is kinda buggy, isn't it? But it sure allows a lot of us an easy and inexpensive (as in no cost) way to blog. Thanks for your comment. Hi Asmita, it's good stuff! I think you'd enjoy it. Thanks for commenting. Hi MyFudo, cherry tomatoes are great in this (or any salad) - they have pretty good flavor most of the year, unlike other tomatoes (which are only good for a fairly short period when they're in season). Thanks for stopping by. Hi Nami, :-) The more I think about iceberg, I really think it's all about its texture and crunch, and not so much about flavor. Asian recipes, with their seasonings, would be a great showcase for it. And if you like blue cheese dressing, you should definitely try it at home at least once - the difference in flavor and freshness is remarkable. Thanks for commenting. I feel like I can't ever have another commercial bleu cheese without trying this one! Sounds delicious. Hi Patty, homemade Blue Cheese Dressing is wonderful. It's totally different from the commercial dressings — very fresh tasting, and a very "clean" flavor. Really good stuff. Thanks for stopping by.